A Dutch correspondent, Hans Dekker, who lives in Den Ham, has kindly sent me some exciting rare photographs concerning Flt Lt Les Knight, the pilot of AJ-N on the Dams Raid, who was killed in a later operation on 16 September 1943. I have told the story of his final flight before, notably in a 2010 obituary of Ray Grayston, his flight engineer, but it bears repeating. Four months after the Dams Raid eight crews from 617 Squadron were sent out with another new weapon, a 12,000lb ‘thin case’ bomb, to attack the Dortmund Ems canal. It was a terrible night, and heavy fog blanketed the target. Four crews had been shot down when Knight, flying at about 100ft in fog hit some trees, and badly damaged both his port engines. His tailplane and starboard engine were also damaged, and Knight was left with no option but to jettison his bomb and get his crew to bale out. He held the aircraft steady while they left and when the last man, Grayston, had gone he must have tried to bale out himself. However as soon as he took pressure off the control stick and rudder the aircraft flicked on its back and plunged to the ground. Knight did not get to the hatch in time. All seven of the rest of the crew (they were carrying three gunners) landed safely. Five evaded capture, while two became PoWs. There is no doubt that they all owed their lives to their young pilot, something that they never forgot. Knight’s crash occurred just outside the village of Den Ham, and he is buried in the village’s general cemetery. 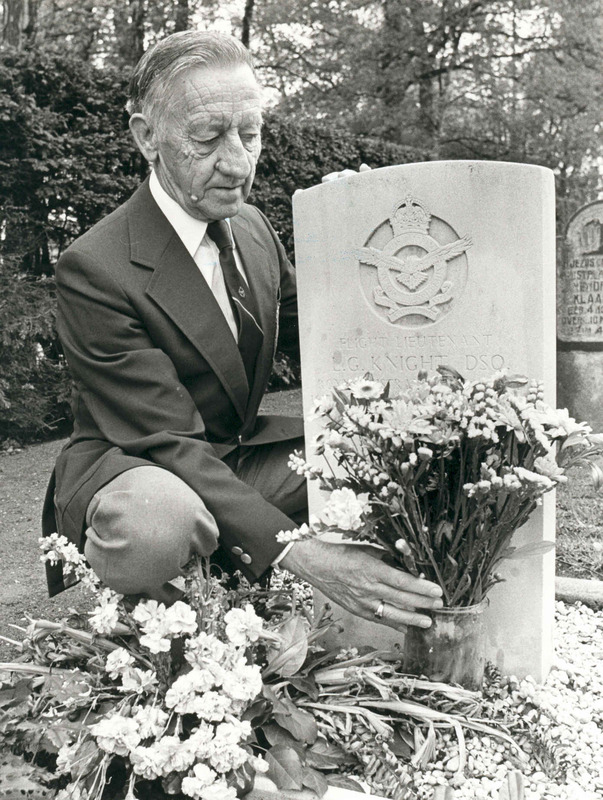 The grave was first marked with a simple wooden cross, which was replaced after the war with a Commonwealth War Graves Commission gravestone. 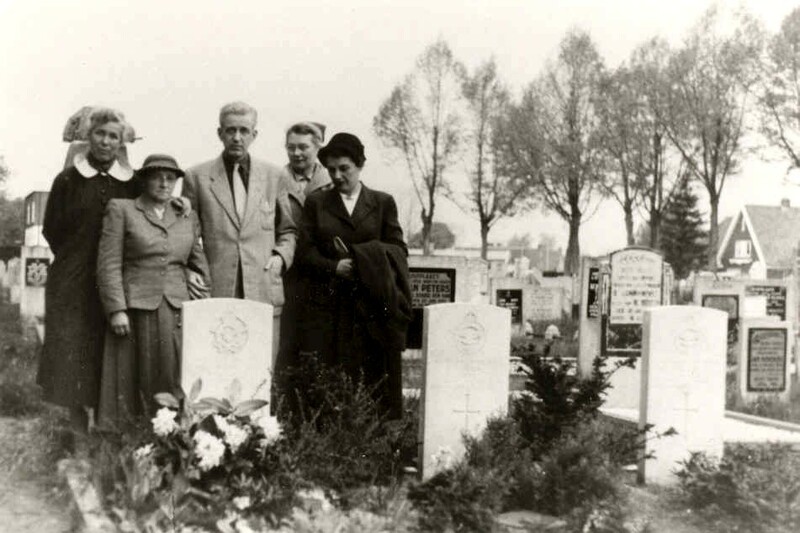 His mother, Mrs Nellie Knight, visited the grave in about 1954. Some other members of the Knight family may be in this picture. I would welcome any further information. Other members of his crew have visited Les’s grave on a number of occasions. Here is Bob Kellow, the wireless operator, probably taken in the 1980s. Finally, here is the full crew, pictured at Scampton in July 1943, as one of the series of publicity photographs taken by official RAF photographers of members of 617 Squadron. 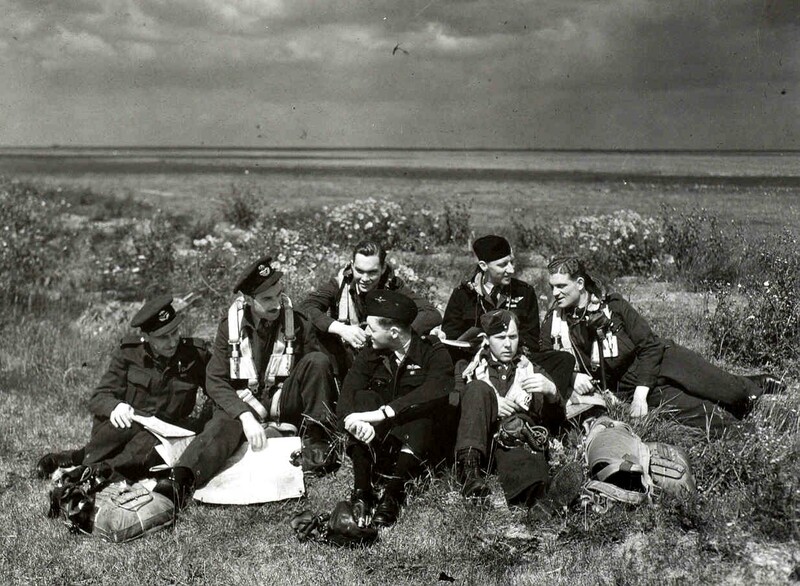 Left to right: Harold Hobday (navigator), Edward Johnson (bomb aimer), Fred Sutherland (front gunner), Les Knight (pilot), Bob Kellow (wireless operator), Ray Grayston (flight engineer), Harry O’Brien (rear gunner). The photo’s as shown were from my collection. Since 1985 I did research about Les Knight and his crew and some of them I met and interviewed. The result I published in a book “Luchtoorlog rondom Den Ham” (1995). How wonderful to see these pictures. Nellie Knight was my grandmother’s best friend and Les and my mum grew up together in Camberwell (Victoria, Australia). My mum was given her very first book by Les for Christmas 1925. It was “Alice in Wonderland” and is inscribed “With love from Les”. She has always treasured it. I knew Nellie Knight in her later years. She was a lovely old lady and so proud of her son. sugesst with greatest of respect that Les’s Loss Deatils are wrong See Below. Les was killed attempting to land his Lancaster and it was a safe landing until he struck a wall which was invisible from the air, the impact catapulted him out through the cockpit and broke his neck killing him instantly. His body was recovered a few feet away from the lancaster. if not for the wall he would have survived – god knows he derserved too. there are many picks around showing his funeral in Holland and also the horse drawn carriage that recovered his body the morning after. all crosses were in German initially as Luftwaffe usually buried those killed . in Canada right now attending service at moose jaw where one of the boys came from. W R Chorley : RAF Bomber Command Losses of the Second World War, Page 322, Volume 1943. On the night of 15/16th September 1943, Lancaster JB144 took off from RAF Coningsby at 2358 hours, detailed to bomb the Dortmund-Ems Kanal near Ladbergen in, Germany. Nothing was heard from the aircraft after take off and it failed to return to base.. The aircraft flew into trees in the target area and later seven of the crew baled out in the vicinity of Amelo, Holland. Flt Lt Knight then attempted a forced landing at 0346 hours near Den Ham, but crashed into a bank, whereupon the aircraft exploded. 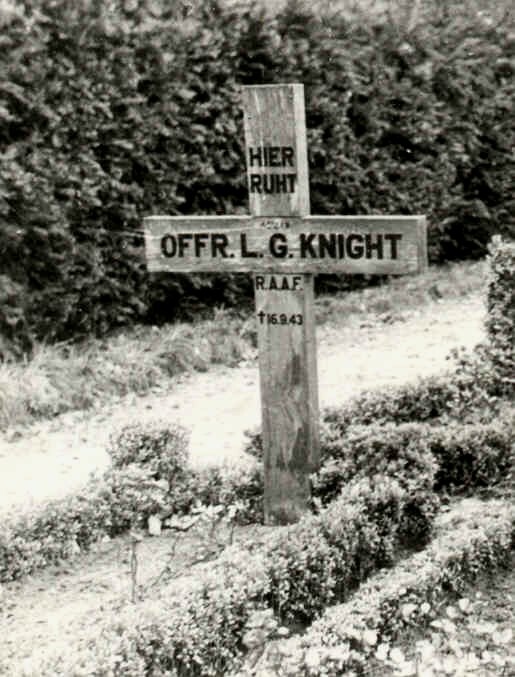 Flt Lt Knight was killed and he is buried in the Den Ham General Cemetery, Netherlands. Den Ham is a large village 16kms north west of Amelo, on the road to Meppel and Three Commonwealth airmen are buried in the Cemetery. The rest of the crew were POW’s or evaded capture. Apart from Sgt Woollard, this was the crew who made the final breach in the Mohne Dam.16/17 May 1943. “ We were number six in the order to bomb the target, and whilst waiting our turn were flying on the outskirts of the target at a height of 50 to 100 feet. We had completed two circuits when I felt a violent bump, which appeared to me to come from almost underneath the aircraft. The pilot started at once to climb and when he reached a height of about 500 feet he sought permission from the leader of the formation to jettison his bombs. Our aircraft for this operation was fitted with R/T for intercom purposes. The Leader of the formation gave permission to Flt Lt Knight to jettison, which he did immediately. Flt Lt Knight then stated over the R/T that he had jettisoned his bomb and would endeavour to make base.. The Pilot continued to climb, but as the two port engines showed signs of catching fire they were feathered. showed signs of catching fire, and was also feathered. The starboard rudder also appeared to be damaged. Before I left the aircraft, the Bomb Aimer and the Rear Gunner left by the front escape hatch and were followed by the Flight Engineer and Navigator. I signalled to the Pilot to ask him if he was alright, and he gave me a sign indicating that he was alright. Knight stated he was going to endeavour to return to base..
For the purpose of the operation R/T was used by the Leader of the formation to call in the aircraft in their order to bomb.. While we were waiting for our turn to bomb the target we were flying through patchy fog..
with bright moonlight, but ground fog developed within the vicinity of the target. The fog did not appear to extend above 200 feet. “. FO Kellow survived the war and was discharged as a Flt Lt from the RAAF on 23 April 1946 after serving in both Europe and the Pacific as Aircrew. On the night of 16 May 1943, a force of Lancaster bombers was detailed to attack the Moehne, Eder and Scorpe dams in Germany. The operation was one of great difficulty and hazard, demanding a great degree of skill and courage and close cooperation between the crews of the aircraft engaged. Nevertheless a telling blow was struck at the enemy by the successful breaching of the Moehne and Eder dams. This outstanding success reflects the greatest credit on the efforts of the following personnel who participated in the operation in various capacities as members of aircraft crews. Fyi my grandmother was cousin of Les, my father was named Leslie…I have copy of letter describing visit to Buckingham Palace and Les being sixth in line to receive D.S.O. written by a relative of Nellie. Dated 29th June 1943. If you are related and don’t have a copy and would like happy to send. My uncle was named Jack…my grandmother was obviously fond of Nellie. My name is Susanne, from Bunbury in Western Australia. My son is doing a project at school about an Australian Hero of his choice. He picked Leslie Gordon Knight because he is very interested in the History of World War one and two. We also visited the Eder Dam in 2013 including the Dam Buster Museum. That’s where we found out about Leslie and his heroic contributions. May I ask, wether you are related to Leslie? If so would you be able to help us with some information for my sons project? My son needs to complete a timeline on Leslie’s life. He has enough information on his time served in RAAF but is struggling to find information about his life prior to joining the RAAF. For example his childhood, schooling, family, post school education, occupation, etc. Any assistance that you could provide would be very much appreciated. Look for the memorial at the crash place! My grandmother, Merle Strickland, was also a cousin of Les Knight. As a child I remember there was rarely an occasion we would visit grandma that she wouldn’t mention Les’s name. She had a photo in her house hung proudly and would speak of him being a talented man. From memory she said he was an accountant prior to his Service and also a talented cricketer. She never got over his death. I am so proud that his memory is living on. The current edition of RAAF news has a story of the dam busters and photos of the crew (page 17). I joined the RAAF myself and my husband is a current serving member of 32 years RAAF Navigator. My son has a current application for ADFA. In some way I feel like our family will hopefully continue to carry the baton. Thank you everyone for your love of Les Knight.